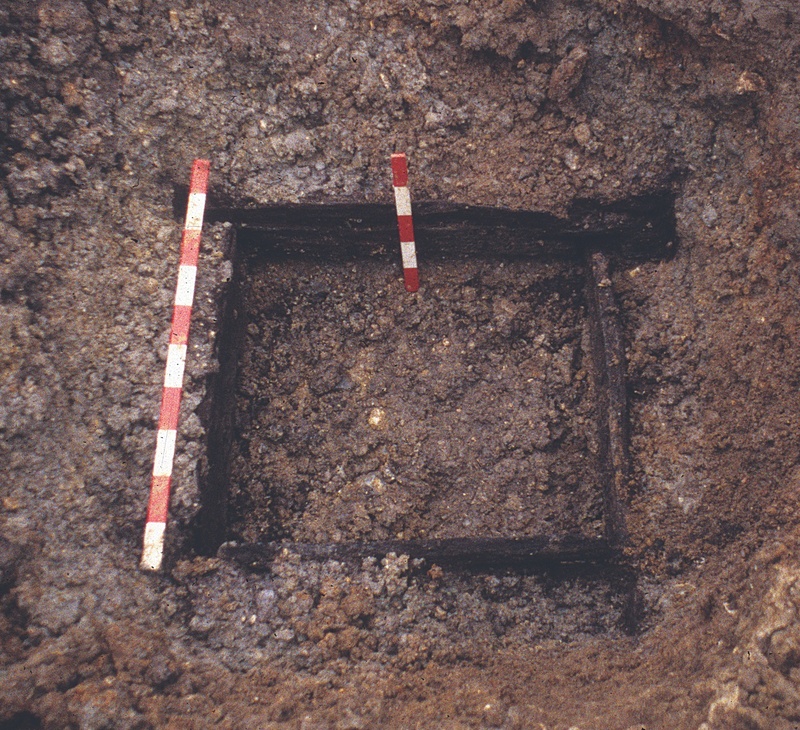 Wessex Archaeology’s excavation, between 1996 and 2009, of two large sites, 250 metres apart, in the London Borough of Hillingdon, uncovered evidence for Neolithic, Bronze Age, Iron Age, Romano-British, Saxon and medieval activity. The sites, near the villages of Harlington and Sipson, immediately north of Heathrow Airport, lie midway between the Rivers Colne and Crane, and the excavations have added significant new information to our understanding of the development of the archaeologically rich landscape of the Middle Thames Valley from the Neolithic onwards. The Early to Middle Neolithic saw the construction of a rectangular ditched mortuary monument, and the widespread digging of pits, many with deposits containing Peterborough Ware pottery. 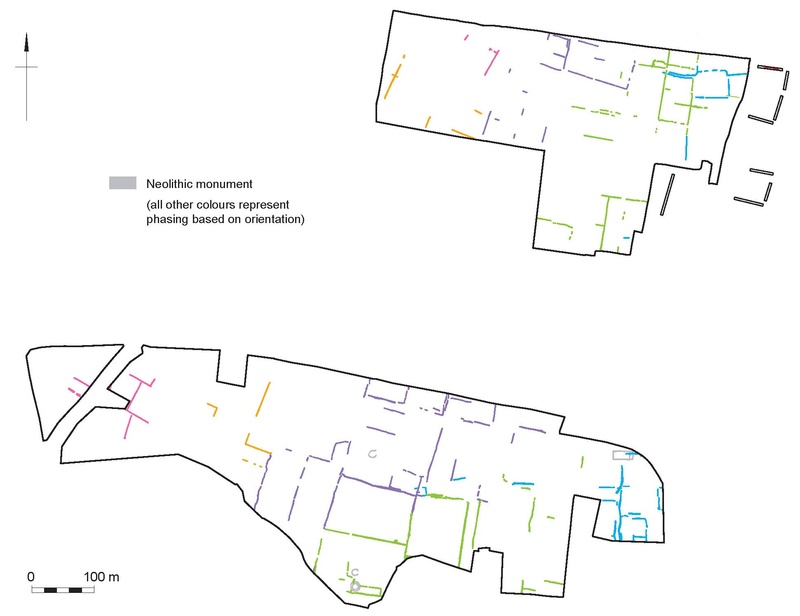 A dispersed monument complex comprising a double ring ditch and two small U-shaped enclosures was associated with rare Middle Neolithic cremation burials. The Middle and Late Bronze Age saw the formalised organisation of the landscape into extensive rectangular fields, within which was evidence for settlement and an associated cremation cemetery. A small Iron Age nucleated settlement was developed in the Roman period with enclosures flanking a trackway, cremation burials, middens and quarries. 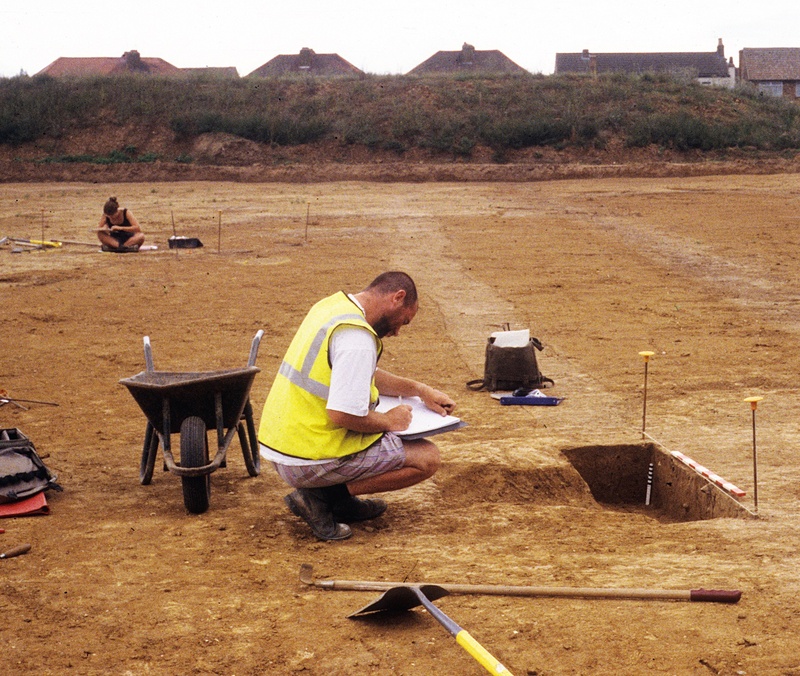 From the Saxon period there are two possible sunken-featured buildings, a small early Saxon cemetery, and the establishment of a middle Saxon and medieval field systems of small enclosures and wells. The two sites were investigated because they were proposed for gravel quarrying. 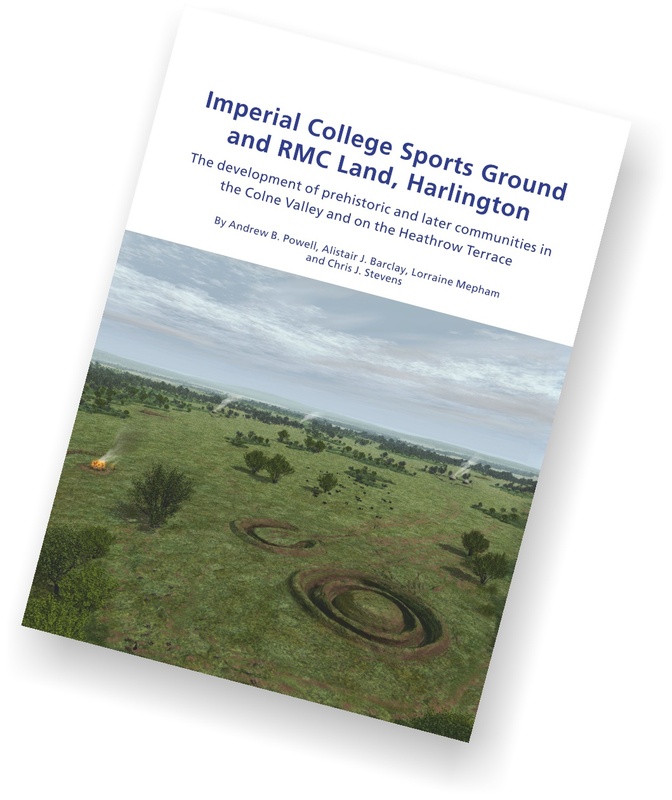 The excavation of the southern site, on the former Imperial College Sports Ground (ICSG), was funded by Henry Streeter (Sand and Ballast) Limited (HSL); the excavation of the northern site, RMC Land, was funded by RMC Ltd, now CEMEX UK. 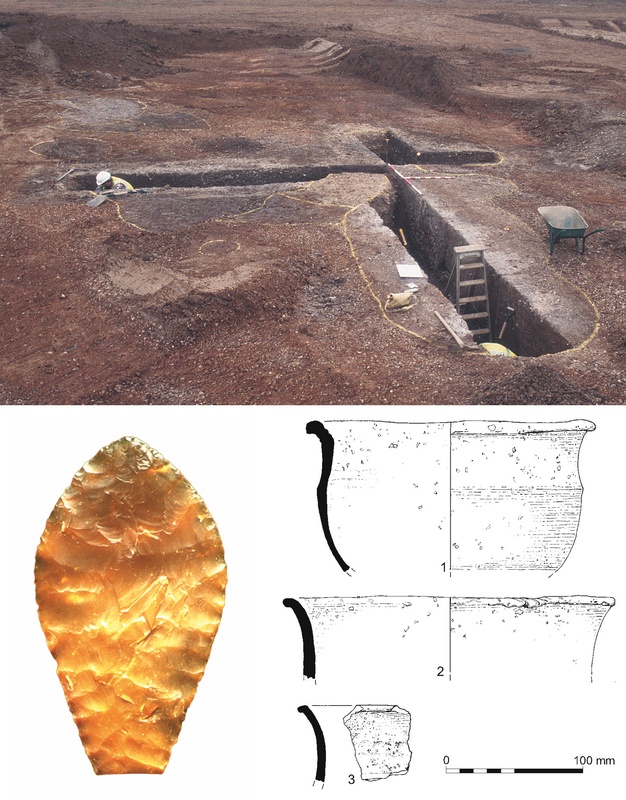 Most of the evidence for Early Neolithic (4000–3350) activity, in the form of undecorated Early Neolithic pottery, came from a series of deep intercutting pits in ICSG, possibly some form of quarry. A number of Early Neolithic flints were also recovered from ICSG but mostly from later features, tree-throw holes or other natural features. These included two very finely worked leaf-shaped arrowheads which were recovered from a Bronze Age ditch and a Bronze Age well. The environment, although wooded, would have witnessed some clearance during the Early Neolithic, so that the Neolithic monuments are likely to have been built in relatively large clearings. A small rectangular enclosure, defined by a substantial ditch, may have been some form of mortuary monument, relating to the disposal of the dead, even though no human remains were found in it. It was 34 m long (east to west) and 15 m wide, although it may have been slightly lengthened as it had another ditch just inside its eastern end. There were no features inside the monument that were definitely associated with it, although magnetic susceptibility readings were much higher in the interior than on the outside, which might indicate that there had been burning inside. Small quantities of Middle Neolithic (3350–2850 BC) Peterborough Ware pottery, struck flint and fired clay, and a single fragment of animal bone, were recovered from the ditch. Similar Neolithic monuments have been found in many of the river valleys of eastern and central England, and although they are generally poorly dated it seems likely that they were built in the middle or late 4th millennium BC. The shape of the monument has some similarities to Neolithic houses, and this may have been part of the symbolism used in whatever ritual activities were undertaken at this monument. Although no human remains were found in the Neolithic rectangular monument, there were also three Middle Neolithic circular monuments, two of which contained unurned cremation burials. The most complex of these was a double ditched monument. The inner ring ditch was continuous, but the outer ditch had a narrow break on the western side. At the centre of the monument was a grave containing the cremated remains of a woman and a young child. A sample of the woman’s bone was radiocarbon dated to 3240–3010 cal BC. There were two other cremation graves inside the inner ditch, and another cutting into the ditch’s fill after it had started silting up. 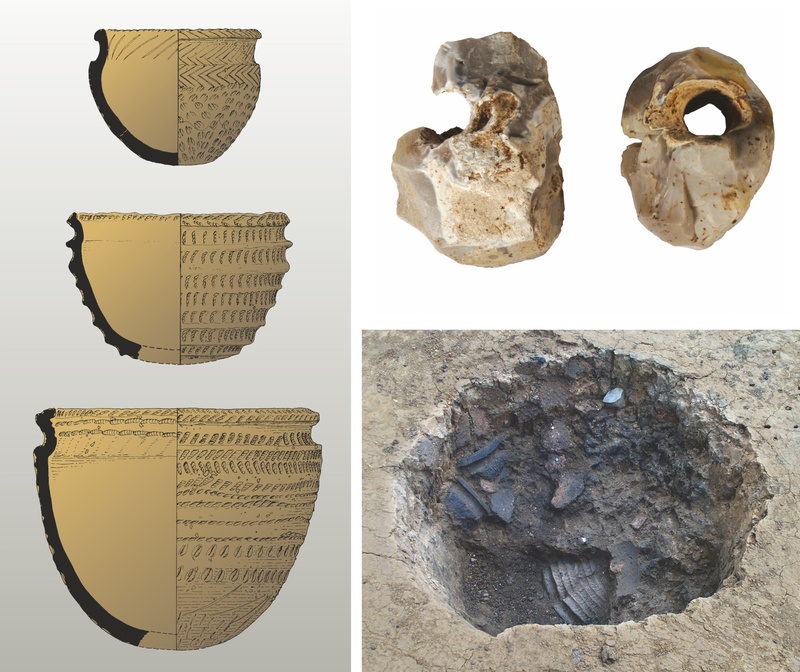 Almost 2000 years later, during the Middle Bronze Age, another feature containing cremated bone, along with part of a Deverel–Rimbury urn and charcoal from a pyre, had been cut into the fill of the outer ditch, showing that the monument had remained an important feature in the landscape. There were also two small U-shaped monuments open on their eastern sides, of a type also widely found in the region. One of these, immediately north of the double ring ditch, contained two further Middle Neolithic cremation burials. The other more distant monument contained no burials, and although it could not be dated its similar shape suggests that it was contemporary. Together, the four Neolithic monuments, all in the southern of the two sites (ICSG) represent a small monument complex of a type that is frequently found on the river gravels of central southern England. Broadly contemporary with the monuments were up to one hundred Middle Neolithic pits. These were found across both sites, many of them in small groups. Most of them were similar in form, being circular in shape and about 1 metre wide. Many of them contained finds, most notably Middle Neolithic Peterborough Ware pottery and worked flints, including fragments from polished flint axes, as well as pieces of burnt flint, fired clay, animal bone and non-local stone. However, while some contained large quantities of finds which appeared to have been deliberately placed, and with some care, others contained very little material, and some contained none, although it is possible that organic objects had been deposited which have since decayed. 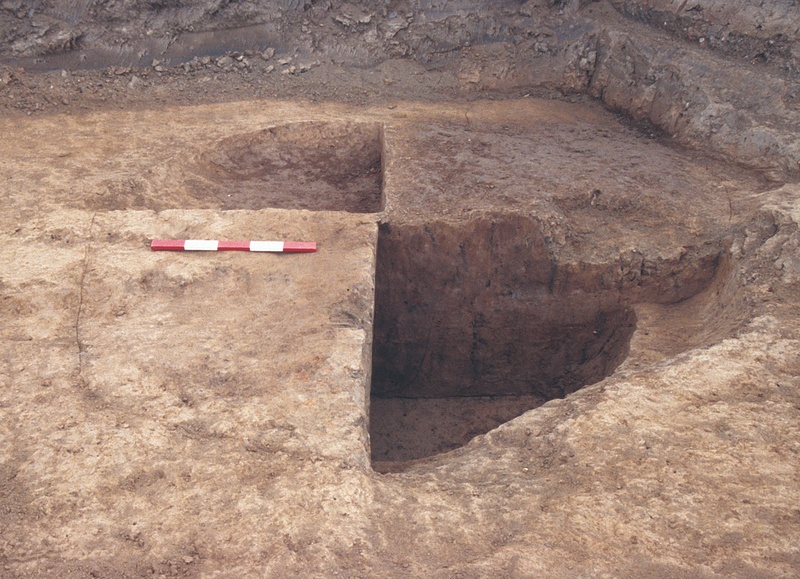 Almost 20 kilograms of Peterborough Ware was recovered during the excavations, most of it from these pits. The vessels belong to the highly decorated Mortlake substyle, in a range of bowl and jar forms. Among the stone objects were a number of pieces of naturally perforated flint. Neolithic mace-heads made of similar stones have been found in the River Thames around London. It is not clear what these pits were dug for, but they demonstrate that people were visiting and re-visiting this part of the landscape. 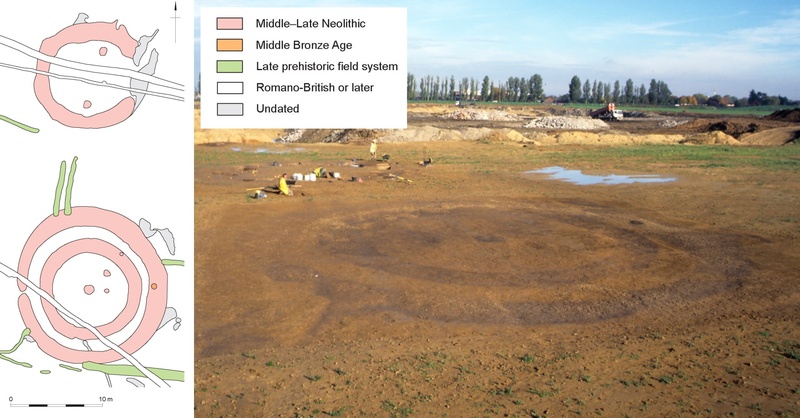 After the Neolithic, apart from a small number of Early Bronze Age cremation burials towards the western end of ICSG, there was little evidence for activity until the Middle Bronze Age when an extensive field system was laid out across both sites. Such large-scale co-axial field systems are a features of many of the sites around Heathrow, as well as more widely in Britain. Although varying in size, the fields, defined by ditches, are all roughly rectangular in shape, and appear to be have been laid out in blocks. Towards the east, on both sites, the field have ditches running north–south and east–west, but further west the axes gradually shift in a very uniform way, suggesting a high degree of organisation. 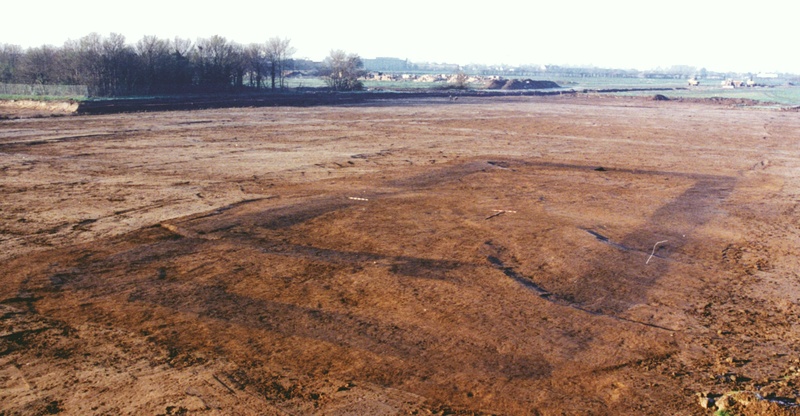 Most of the Middle Bronze Age Deverel–Rimbury pottery was found in features, such as ditches, pits and waterholes, in the south-eastern part of ICSG, indicating a settlement in this area. Nearby, and probably associated with the settlement, was a small cemetery containing up to 13 cremation burials, some of them deposited in urns. Another burial was made in the ditch of the Neolithic double ditched monument circular monument. One of the waterholes within the field system contained a 1.65 metre long timber with three regular notches cut out of one side perhaps so that it could have been used as a ladder. It was radiocarbon dated to 1210–910 cal BC (Middle–Late Bronze Age). Elements of the field system remained in use during the Late Bronze Age (and possibly into the Early Iron Age), although by then the pattern of settlement appears to have expanded, with features of this period being found more widely across both sites. 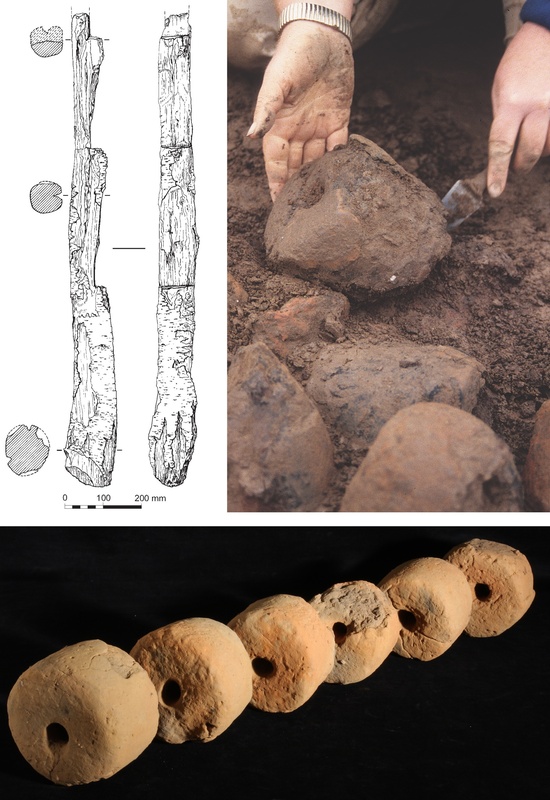 Although no houses were identified, there was clear evidence for domestic activity in the form of pottery, worked flint, animal bone, fired clay and hearth waste, and, in one pit, 16 cylindrical loomweights. One large deep feature, probable a well, contained the base or lid of a wooden vessel which produced a radiocarbon date in the Late Bronze Age of 1110–900 cal BC. During the Iron Age the Bronze Age field system was finally replaced by a new organisation of the landscape, at least in the eastern half of ICSG. Here evidence was found for a small Middle–Late Iron Age open settlement of roundhouses and pits. Close to the settlement was an inhumation burial in a pit containing Middle Iron Age pottery, worked and burnt flint, and animal bone – of cattle, sheep/goat, horse and pig. Next to the settlement was a 30 metre wide square ditched enclosure, with an east-facing entrance at its north-east corner. Although the enclosure had no features inside it to indicate its function, it was clearly of some importance as its ditch had been cleaned out and recut on a number of occasions. The Iron Age enclosure was subsequently incorporated within a series of Romano-British enclosures, with the same orientation, arranged along both sides of a trackway – suggesting that the trackway had probably been established during the Iron Age. 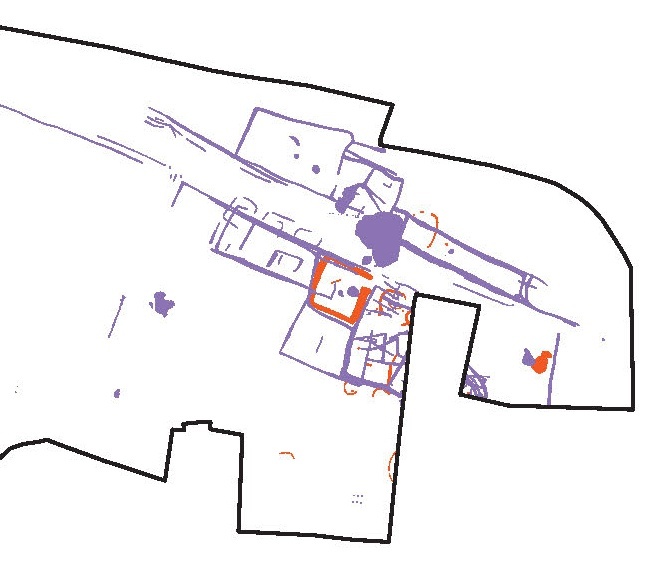 Although no Romano-British buildings were found, large quantities of domestic debris accumulated in the enclosure ditches as well as in spreads of midden material, suggesting settlement in the immediate vicinity. The Romano-British enclosures underwent a number of phases of reorganisation, with each new set encroaching further into the trackways, which was eventually narrowed. The purpose of the trackway is suggested by angled fence lines, further intruding into its line, which appear designed to funnel livestock into the adjacent enclosures. The environmental evidence points to a landscape of open grazed, wet, rough grassland, with patches of bare, animal trampled ground, although there were some arable fields within the general vicinity. In the corner of one enclosure were the bottom courses of a box-frame for a timber-lined well, the wooden slats having notches cut out near their corners so they slotted together to form a rigid structure. Evidence for Saxon and medieval occupation was found on both sites, the environmental evidence indicating some continuity of arable farming from the Romano-British period, alongside pastoral activity. For the early Saxon period (5th to 7th centuries) the presence of sunken-featured buildings and pits add to a body of evidence for a focus settlement of between the rivers Colne and Crane, from Harmondsworth to Hayes. In addition, on the southern edge of RMC Land, there was also a small early Saxon cemetery containing at least three, and possibly five, inhumation burials dating to the 6th century AD. 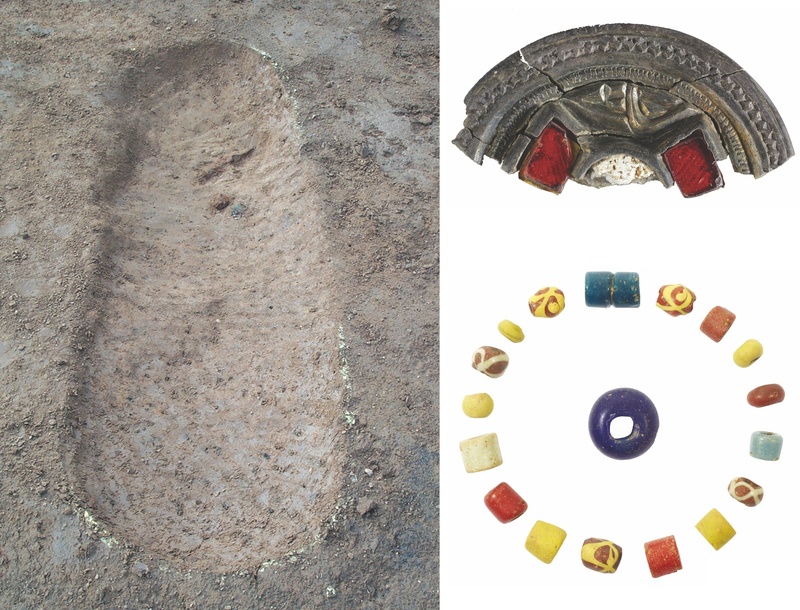 None contained any human bone, due to the soil conditions, but three produced grave goods, including a silver garnet brooch, colourful glass and amber beads, two iron knives and an iron buckle. By the middle Saxon period (7th to 9th centuries), however, change is apparent, and perhaps the most important finding has been the identification of a middle to late Saxon settlement at RMC Land, adding to the extremely small body of settlement data for this period in the London area. The evidence includes a fenceline and a small, post-built structure as well as a few pits and waterholes. Between the late 9th and 11th centuries this settlement developed into a complex of enclosures, small fields and inter-connecting droveways, which was apparently abandoned around the time of the Norman conquest. The main focus of the settlement probably lay within the historic core of the present village of Harlington, and it operated in a largely open landscape which still supported both arable and pastoral regimes. 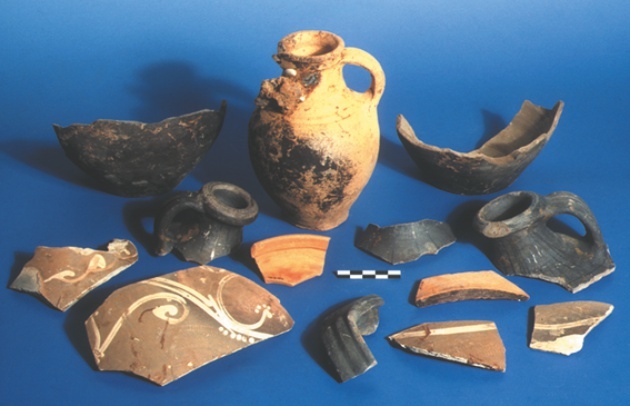 Traded goods are more apparent in the middle to late Saxon period, including regional pottery wares from the Midlands and East Anglia, and imported continental lava quernstones. Any of these could have been traded through the major trading port of Lundenwic, which developed from the late 7th century. 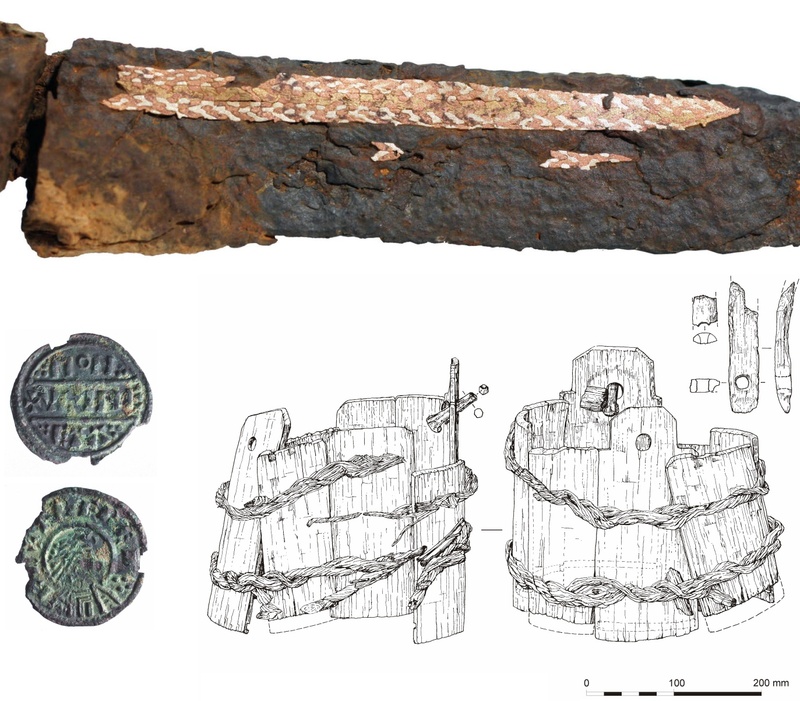 Among the other finds recovered were spindle whorls, loomweights and a pin beater providing evidence of textile making, a silver penny of Ælfred the Great (AD 871–899), and a finely made knife with decorated inlay. Although the settlement at RMC Land appears to have been abandoned (or shifted to the area of the current village), the field system seems to have been maintained at least into the 12th/13th century, while further to the south, at ICSG, a field system was laid out probably in the 12th century. The field layout at ICSG seems to have persisted largely unchanged well into the post-medieval period, and the village retained its rural character well into the 20th century. A stave-built wooden bucket was found almost intact at the base of one of the medieval waterholes at ICSG, bound together by lengths of twisted rope (withies) made of willow/poplar. 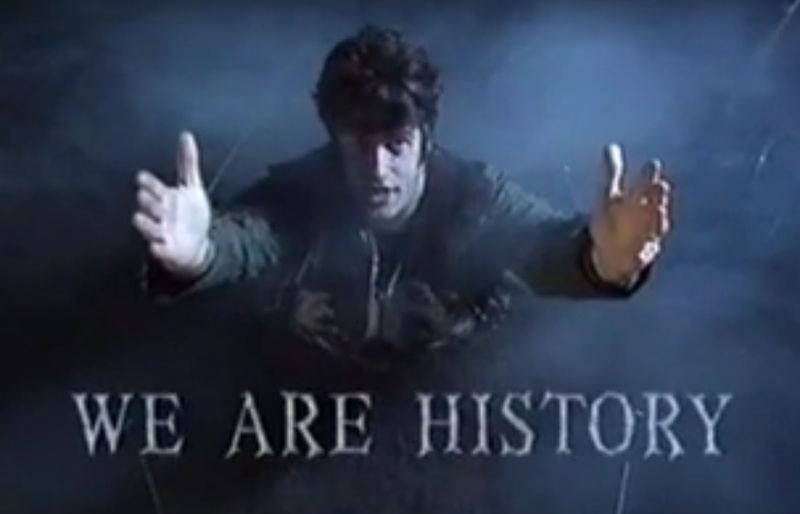 Programmes like Time Team and Meet the Ancestors changed the way archaeology is now presented on television, and in April 2000 the excavation at ISCG got its own very distinctive coverage, when it featured in the BBC’s We are History series, which threw surprising new light on the site’s past (or not).